"Self, you are one of God's personal jokes to see how long someone can TRY to exercise patience before truly snapping on someone". 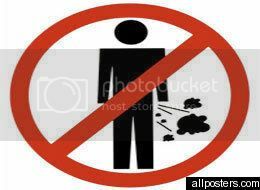 I mean seriously...am I NOT supposed to say anything to someone who BLATANTLY farts NEXT TO ME in the grocery store? "My bad. My coworkers are rude"
"I'm saying though, it's a normal body function"
"Yes, it is but you could at least walk AWAY from customers"
"They know it's a normal body function"
"True but you couldn't walk away so they wouldn't know it's DEFINITELY you? You're so rude"
Security guard decides to put in his two cents, "Everyone knows about the "walk away"; that's the least you could have done. That's rude to your coworkers AND the customers". "I mean when I'm shopping or in the club, I do the walk away but hell, I'm not holding in no gas for nobody"
The security guard (a man) is now grossly appalled at this woman and says "you be farting in the club? you foul as hell". At this point, I guess the manager chimes in and all I could pick up as I walked past her MAKING SURE she saw my look of disgust, something about in the employee manual there is a section about behavior at work and this was not exemplary. People like this STILL have jobs...why? ROFL. That's awful and trife. Girl, why did I think of you while I was at the grocery store checkout this morning. I absolutely hate when people put their ish right up next to yours on the belt, like they just can't wait. This time the kicker was dude's stinky cologne. I could feel my blood pressure rising and I started to turn around to tell him to back the eff up, but one of the cashiers caught my eye and smiled...that's the only thing that snapped me out of pure evilness. I wanted to ask him if he was planning to pay for my ish, if so, he still didn't need to be that damn close. Im so sick, laughing made mocos come out...so gross! I was rollin' @ the conversation that happened and then I had to scroll down and see one of your tags is "poot"?! I am so glad I was home alone because I don't think I could explain the sound I made upon reading that, LMAO! Yuk! I'm a guy but not even I would do that! I thought this was about you!!!! LOL!!!! Your description of the scene is so good that it is in "scentsurround!" (You may be too young to know that back in the 70's, they made disaster movies with big oversize speakers so that when you saw the movie Earthquake, the theater actually shook! Anyway, I could smell something coming outta my computer! BTW, I have a related post on my blog that I did a few days ago, you might want to come on over and scroll down to find it, it is a flatulence related comic. It would be an honor to have you as a visitor! Much Love and Respect from "Mrs. Slug"